Treat Dad to a super steak dinner. Steaks grill up juicy and succulent when you brush them with your favourite BULL'S-EYE Barbecue Sauce. Grill on the barbecue Dad's favourite cut of steak (follow cooking times below). 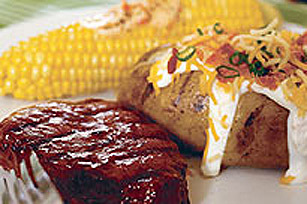 During grilling, brush steaks generously with Bull's-Eye Barbecue Sauce. Porterhouse/T-bone steak = 14-16 min. Rib-eye steak = 11-14 min. Filet mignon = 8-11 min. To preserve juices, use long-handled tongs for turning meat instead of a fork. Preheat charcoal grills until a thin coat of gray ash covers the coals (about 30 minutes), or for gas grills, 10-15 minutes on HIGH, then turn dials down to MEDIUM-HIGH. Let all cooked meats rest 2-3 minutes before carving to redistribute juice.